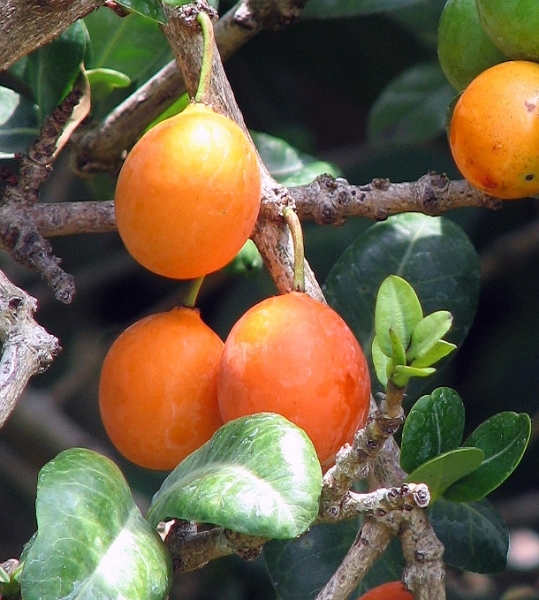 Originating in Africa, this tree bears a small plum like fruit bright orange in colour. A thin layer of acid-sweet, watery pulp surrounds the seed. The rather tender skin tends to prevent packing and shipping of the fruit, but it deserves to be more widely cultivated as a home fruit. Hardy to most conditions. Dark green leathery leaves and ornamental structure make it appealing as an interesting and edible landscape plant. 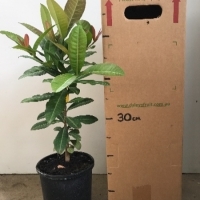 Grows to a bush or small tree to 4-6 m. Imbes have good salt tollerance and are also wind tollerant.Trees are dioecious, so one of each a male and female are needed for pollination and fruit set.Plant a minimum of 3 seedlings to increase the chances of having one of each.Isolated female trees will set a few small fruit parthenocarpically but the quality and size is always better with a male pollinator.